When you want to encourage your little ones to eat healthy, or when you want to have your friends over who are just as Disney-obsessed as you, you want to serve some food that is Disney themed! Of course, if it’s simple to make, all the better. This Pixar inspired Up house fruit tray is sure to impress with how adorable it is, and just involves prepping – no cooking! Plus, seeing a fruit tray inspired by a Disney movie is a great motivator for kids to eat their fruits and veggies – it works for my little one all the time! Using a melon baller, scoop out about 12-15 balls of each kind of melon, and place in a large circle on a dinner plate. On your cardstock, draw a 2.5 inch Up house. You don’t have to be a great drawer to do it, since it’s so small, just the basic shape and colors will do fine! Cut out your house and place at the bottom of the plate right up against where your melons begins. 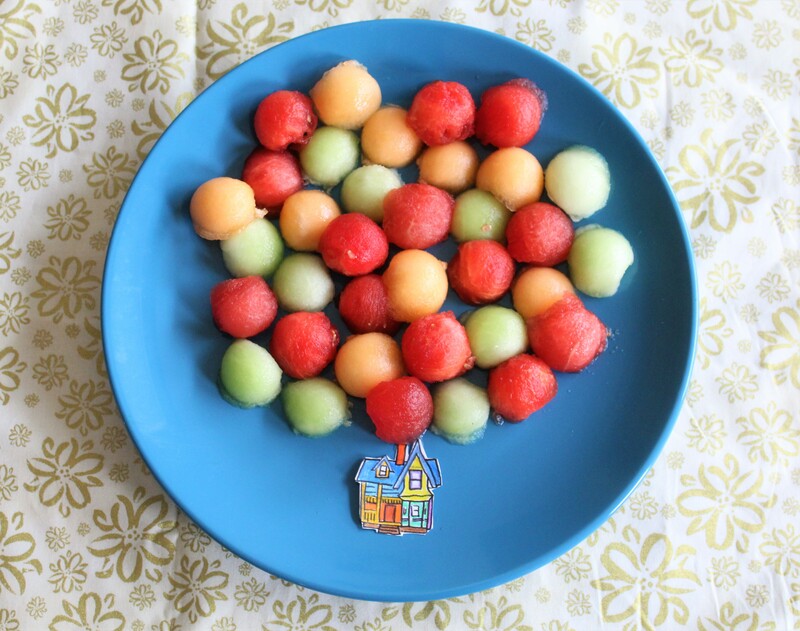 Enjoy this Up House fruit tray!